CLEVELAND, OH (WOIO) - Donations from concerned people across northeast Ohio are starting to flow into all four Hooley Houses including one in Brooklyn. Roy Grimes and his Dad are d ropping off their items. They say the water crisis in Flint has really touched a nerve. "I follow Will Burge on Twitter and he is making a big push for it and it seems like the right thing to do. It doesn't cost that much money. It helps somebody out," said Roy Grimes. WTAM 11OO radio host Will Burge over the weekend had heard enough from politicians pointing fingers of blame at each other and decided maybe northeast Ohio could help with a solution. "I figure we had to do something and it all came together in 24 hours and its much bigger than I anticipated," Will Burge added. We found another Mobile Mini getting loaded up with donations in the parking lot of the Hooley House in Westlake. "I know what's it like to go with out water or electricity for 3 or 4 days and it's very hard and I can't imagine what they are going through," said Anne Antonius from Cleveland. People in Flint need water, baby wipes, hand sanitizer, jars of peanut butter or jelly and children's books. 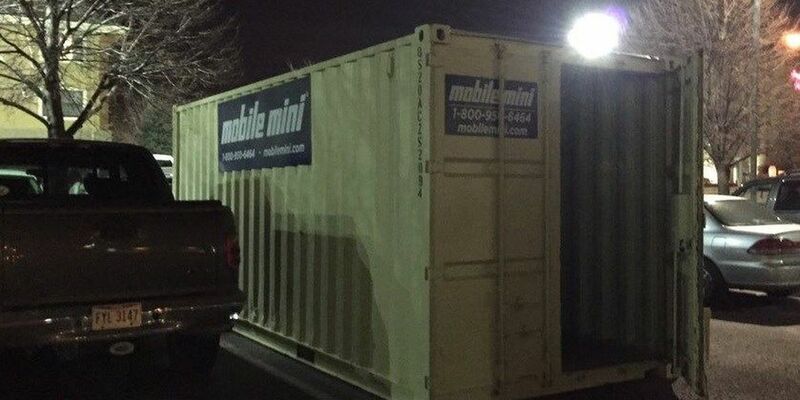 Mobile Mini is supplying the crates with help from I-Heart Radio and the Hooley House plus RAKE which is run by local comedian Ricky Smith who has already d ropped off nearly 5,000 gallons of water to Flint. fortunate to live here in Cleveland on Lake Erie where there is so much fresh water and that's a great thing," Dan Schlegal from Cleveland said. You can d rop off donations daily between 11 a.m. and 9 p.m.